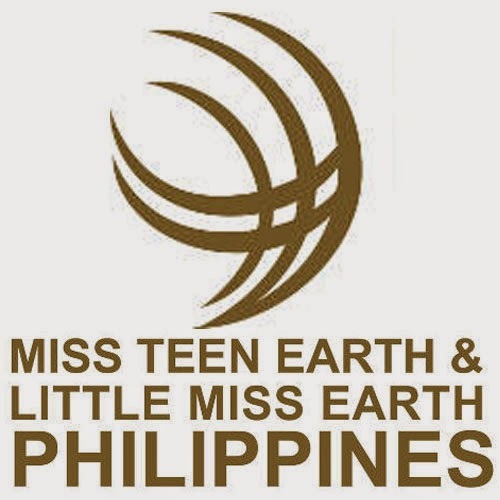 For over two months, Miss Teen Earth and Little Miss Earth Philippines staff have scoured the archipelago in search of young beauties who embody the advocacies of conservation, preservation and protection. We looked beyond their physical attributes and chose girls who conveyed a genuine love for mother earth and who are capable of becoming 'Earth Champions' even at a young age. It all began in January where hundreds of hopefuls aged 4-9 and 13-17 flocked to auditions in Cagayan de Oro, Cebu, Davao, Iloilo, Naga, Baguio, Batangas, Pampanga and Manila. Nearly a thousand girls took part over the course of several weeks. Through a series of preliminary eliminations, the list was narrowed down to 20 teens and 20 little girls. Less than a week after the forty finalists were named, they were all brought to Manila to begin their journey. The next few days would be a flurry of activity. Each teen contestant was assigned to one little girl to act as her 'big sister' over the course of their journey. On day one, the finalists wowed everyone in their first photo shoot for the free pageant supplement, 'Roots.' The girls donned the simple yet fashionable 'Jeepney' collection by stylist Jeffry Rogador. Teen Actress and singer Julie Anne San Jose also had a photo shoot for the supplement's cover on the same day. After a fun-filled day they all returned to the Holiday Inn to get some beauty rest and to prepare for the next activities. The next day, the girls were treated to a seminar facilitated by maker of Beauty Queens Jonas Gaffud who taught the girls the same tips he gave the likes of Venus Raj and Megan Young.Then the girls got a surprise guest, in the form of another Jonas Gaffud-trained beauty, Shamcey Supsup. She began mentoring the girls by sharing her experiences and her journey towards becoming a beauty queen. That afternoon, they paid some of our media partners a visit. The little girls went to visit the office of Total Girl Magazine, where they got to meet the whole magazine team and got free issues of Total Girl. While the teens went to visit the office Celebrity Mom and Inside Showbiz at One Mega Group. The teens also visited the Philippine Daily Inquirer offices where they toured the editorial offices and the radio station. To end the day, TV Host and actor IC Mendoza, who is also the PR Head of the pageant, delivered an informative talk on how to handle interviews and the press. Special guests that night were respected Entertainment Journalists Dolly Anne Carvajal and Nelson Canlas where they had the opportunity to bond with one another. The next day, they headed to Manila Ocean Park where they had fun interacting with marine life and And in the afternoon, their mentor Shamcey Supsup accompanied them to the Tagaytay Residence Inn where numerous fun activities awaited them; including a tree-planting activity. Next on the agenda was a trip to Zoocobia in Clark, Pampanga where they again participated in a fun tree-planting activity. Then in the afternoon they visited zoobic safari in subic where they were treated to an entertaining animal show, a thrilling lion and tiger safari and an exciting visit to the crocodile park. For their last activity, our candidates visited Gandica Cafe in Ortigas where they tried some archery lessons. Candidate number 1: Mary Joy Ramos, 16 years old from Sorsogon city. She has a penchant for thrilling movies (particularly slasher flicks) and admits to often daydreaming about her future life. Candidate number 2: Jhoanna Jane Layos, 16 years old from Cebu. loves to play volleyball and badminton and wants to be a diabetologist someday because of his lolo. Is a home buddy and hates dishonest people. Candidate number 3: Jasmine Hodges, 14 years old from Laguna. Flattered to be Andi Eigenmann look alike. Likes basketball and dreams of playing with Jeron Teng. Afraid of deep unclear waters because of whales but dreams of becoming a vet one day. Candidate number 5: Merry Grace Tubelleja, 17 years old from Iloilo. describes herself as small but terrible. Has curfew up to now, wants to hype iloilo as a beautiful city. Candidate number 6: Shawntel Michole Cruz, 17 years old from Baguio. A home buddy who loves to sketch. She's a leader of the youth ministry. She dreams of being a songwriter and a fashion designer. Hates backstabbers. Candidate number 7: Marie Shane Ortega, 15 years old from Cebu. Has a fear of heights. Admits she's boyish because she acts like a boy and eats like a boy at home. Candidate number 8: Jasmine Carla Famoso, 14 years old from Iloilo. loves to sing and play badminton. She admits that she's easily mad sometimes and sometimes compares herself to the hulk. Candidate number 9: Deanne Patricia Carmel Perez , 17 years old from San Juan. She wants to be an author someday. She dreams of writing novels. She loves nicholas sparks and john green. She's doing for her mentor, her sister who was a former model but now has stage 4 cancer. Candidate number 10: Angeliza Navajo, 16 years old from Misamis Oriental. She loves to draw cartoons, has a huge crush on dingdong dantes and loves to bond with friends. Candidate number 11: Zoe Stephanson, 15 years old from Las Pinas. Her peers call her the "Noisy Valedictorian" because even if she's noisy in class, she still gets good grades. She's currently taking up BS Nursing at UP Manila and dreams of being a general surgeon someday. Candidate number 12: Candise Bero, 15 years old from Davao. She confesses that she had a hard life in Papua New Guinea. She was once held at gunpoint and nearly assaulted. She comes from a broken family and admits she was raised by her yaya and was often bullied because of her skin color growing up. But amidst all her troubles, she finds solace in her faith which is further strengthened by constantly reading the Bible. Candidate number 13, Bea Aquino, 17 years old from oves to bake and dreams of having a travel agency one day because at a very young age she got to see Europe, North America and Asia. She's a fan of Greek Mythology and admits to being of NMSB (no manliligaw since birth). But there was a guy she fell in love with, but she was friendzoned then when she joined this pageant the guy tried to win her back but then she friendzoned him. Candidate number 14: Francesca Taruc, 15 years old from Pampanga likes reading short stories and dreams of falling in love one day with the right guy. She likes to bike on her free time. Candidate number 15: Rubyann Quizzagan, 16 years old from caloocan city. She likes to relax and go to the spa. She admits to being masungit when provoked. Looks up to the real and candid Angel Locsin. She is a Tourism student. Candidate number 16: Vanessa Walters, 14 years old from Cebu. She is friendly and sociable because she loves having fun with new friends. Hails from Australia and wants to make the philippines as clean and as green as her other homeland. Candidate number 17: Ella Lubag, 17 years old from Sta. Rosa Laguna. She is a Chemical Engineering student who dreams of becoming an astronaut and scientist. She likes to play the violin in her free time. She may be quiet sometimes but she says she's not shy. To her, being silent means she's just being observant of her surroundings and peers. Candidate number 18: Kryzza Hilay, 17 years old from Iloilo city, has quite a lot of modeling experience. She keeps a virtual diary and wants to be a writer by profession someday. She admits to being secretive and wants to find a guy whose taller than her--which she admits might be quite difficult. Candidate number 19: Ahtisa Manalo, 16 years old from Candelaria Quezon. loves to read thriller books and wants to be a public accountant. She also loves to sketch, has a weakness for chinito cuties and thinks here greatest weakness is that she trusts too easily. Candidate nuumber 20, Stephanie Pasion, 15 years old from Davao admits she is flattered to be dubbed a "Shamcey Supsup lookalike." Tags herself as quirky and odd sometimes and admits her comfort food is balut. Candidate nunmber 1: Bethany Ramos, 5 years old from Cagayan de Oro city. Loves to dance and sing. She wants to be a doctor someday and idolizes beauty queens Shamcey Supsup and Venus Raj. Candidate number 2: Shaina Rodriguez, 4 years old from Naga city. She dreams of being a beauty queen and doctor someday. Her biggest idol is Lea Salonga. Candidate number 3: Maeca Bermas, 6 years old from Camrines Sur. She dreams of becoming a doctor and a beauty queen someday. She loves to sing, dance and recite poetry. Her idols are Ariella Arida and Anne Curtis. Candidate number 4: Hanna Savellano, 6 years old from Bulacan longs to one day become a beauty queen just like Megan Young. She loves to sing, dance and act. She also idolizes Jennifer Lopez. Candidate number 5: Azaiesha Abellana, 5 years old from Bataan. Dreams of becoming a teacher someday. She loves reciting poetry, singing and dancing. Her idols include Marian Rivera, Carla Abellana and Janine Tugonon. Candidate number 7: Nasreen Rahhal, 7 years old from Makati City. She dreams of being a doctor and commercial model someday. She loves to sing and dance. She claims to be Taylor Swift's biggest fan. Candidate number 8: Tyra Pilapil, 7 years old from Iloilo city is determined to finish her studies and dreams of becoming a beauty queen someday. Her talents include declamation, dancing and singing. She idolizes Tyra Banks and Megan Young. Candidate number 9: Bernadette Datu, 6 years old from Bataan. She dreams of being a doctor, fashion designer, artist and model someday. Loves to sing, draw and act. She idolizes beauty queens Megan Young and Shamcey Supsup. Candidate number 10: Keanna Nagales, 8 years old from Bulacan. She dreams of becoming a teacher. She loves to sing and dance. Her idols include Venus Raj and Sarah Geronimo. Candidate number 11: Krystal Brimner, 7 years old from Laguna dreams of becoming a beauty queen, loves to sing, dance and act. She likes Solenn Heusaff and Shamcey. Candidate number 12: Anne Gaza, 8 years old from Pampanga dreams of becoming a supermodel someday. Her talents include dancing, singing and modelling. Looks up to Tyra Banks and Anne Curtis. Candidate number 13: Joyce Angedan, 8 years old from Batangas. Dreams of becoming a lawyer and beauty queen someday just like Megan Young. She oves to sing and dance. Candidate number 14: Huezine Ciar, 7 years old from Quezon dreams of being a doctor. She loves to sing and dance and idolizes Anne Curtis, Marian Rivera, Shamcey Supsup. Candidate number 15: Candesse Bartolome, 8 years old from Davao dreams of becoming a beauty queen just like her idols Shamcey Supsup and Megan Young. She loves to sing, dance and model. Candidate number 16, Alexis Navarro, 9 years old from Bulacan. Dreams of becoming a star someday. Her talents include dancing, acting, modelling and doing magic tricks. She is a big fan of Marian Rivera, Megan Young and Shamcey Supsup. Candidate number 17, Joseayn Albasin, 8 years old from Cagayan de Oro City dreams of traveling around the world and becoming a dermatologist someday. Her talents include singing, dancing, acting and rapping. Candidate number 18, Chyquie Uy, 9 years old from Davao dreams of becoming a beauty queen and flight attendant one day. Her talents include acting, singing, dancing and martial arts. Celebrity idols are Kim Chiu, Carla Aballena and beauty queen Bea Rose Santiago. Candidate number 19, Juviel Viado, 9 years old from Baguio dreams of traveling to other countries particularly to the USA. Her talents include dancing and drawing. And she idolizes Marian Rivera and Kristen Stewart. Candidate number 20, Jhiara Episioco, 9 years old from Quezon City. She is determined to finish her studies and wants to be an earth ambassador for mother earth. Her celebrity Idols include Kathryn Bernardo and Shamcey Supsup. Manila, Philippines, April 25, 2014 - International Micro Village, Inc (IMVI) is now appointed the authorized distributor of Double-Take products in Philippines. 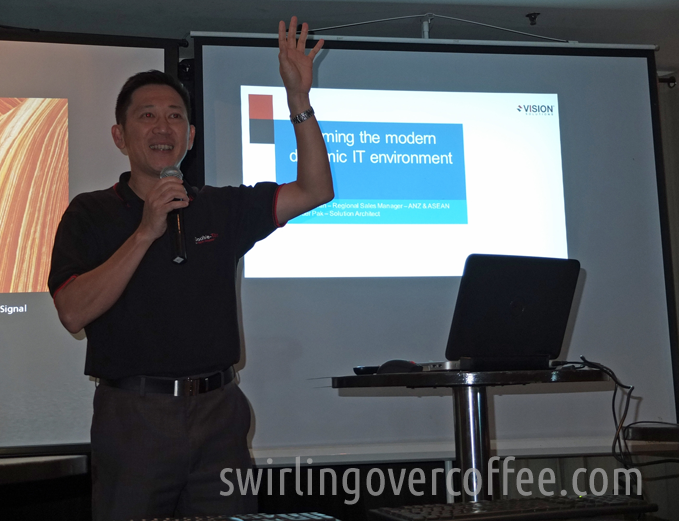 IMVI, with industry expertise and a wealth of experience, will provide Double-Take products and technical support to re-sellers and end customers in Philippines, to meet the increasing demand for cloud replication and recovery, high availability and disaster recovery, migration and cross-platform data sharing. Double-Take is one of the flagship software products by Vision Solutions, a leading provider of workload migrations, high availability, diaster recovery and data sharing software and services with headquarter in Irvine, California, USA and offices worldwide. Double-Take is an afrordable solution for SMB, mid-tier and enterprise-level high availability disaster recovery and migration for Windows, Linux and cloud computing environments. Double-Take 7.0 provides high availability, disaster recovery and migration capabilities for VMware, Microsoft Windows Server and Linux as well as the KVM, Microsoft Hyper-V and Xen hypervisor technologies. More information can be found at www.visionsolutions.com/DT7. Vision Solutions is the premier provider of software solutions designed to protect data, minimize downtime and maximize resources for the modern data center. We are the only company to deliver workload migrations, high availability, disaster recovery and data sharing - across any hardware and any physical, virtual or Cloud-based environment. We have been serving enterprises and managed service providers for over 25 years through our portfolio of Double-Take, MIMIX and iTERA product brands. Filipino abstract painter, Chiqui Rodriguez announces her major new series entitled SUDDEN FLIGHT, her solo show to be held in Zurich by late summer will have its preview opening in a two-man show at the Picasso Boutique Serviced Residences, hosted by Altromondo Gallery on 29 May 2014 and continuing through 18 July 2014. The 19 selected paintings from a total of over 100 works that comprise the SUDDEN FLIGHT series, awash in vibrant color, are sure to dazzle visitors to the Picasso Boutique Serviced Residences. Chiqui’s unique approach to blending acrylic pigments on canvas creates gem-like surfaces. Peering through the surface to what is depicted below, the viewer realizes that all is not as glowing as it first appears. Chiqui is noted for her deep abstraction of complex realism. 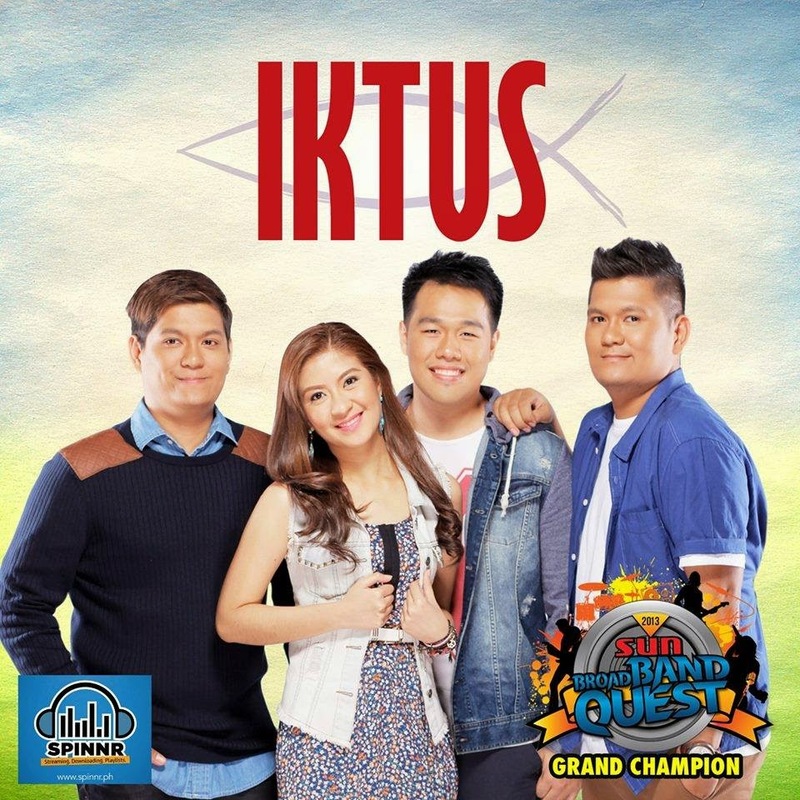 Iktus, the winner of the 2013 Sun Broadband Quest, Composed of Carizza Panaligan on vocals, Augusto Mendoza on guitars, Andrei Panaligan on bass and Andrew Panaligan on drums, Christian Band Iktus got its name based on the Greek word “ichtus” which stands for fish, a common symbol for Christianity. The band names Rivermaya, Silent Sanctuary, Sugarfree, Itchyworms, Urbandub, Paramore, Flyleaf, Switchfoot and Run Kid Run as its musical influences. "Our song are all original and it offers all emotions about love, hope and positivity, we want people to know how important it is to achieve happiness in this world despite problems and troubles" Andrei said, imaging the identity of a true Christian band. You can get IKTUS EP in Odyssey an Astroplus outlets and can also be downloaded via iTunes and Spinnr Ph. For bookings and inquiries, contact Mr. Sammy Samaniego of MCA Music Artist Management at +632 916-2504 local 107, +63917-8565174 and +63920-9682991. 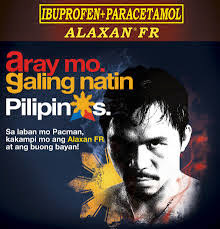 After Manny Pacquiao's fight, I think it is also timely that I give a share of review on one of the products that the Filipino Pride endorse and uses. For years, we’ve been using Alaxan at home for relief of body and muscle pains. But doctors said that Alaxan is a muscle relaxant, and should not be used to treat headaches because the pain will not subside. So that’s why it never helped with my migraines in the past, oh well silly me for not reading the labels. I was glad that Alaxan FR came out because it was in capsule form. The old Alaxan came in tablet, which made it hard for me to swallow. It also tasted bitter, and would take forever to take effect. As we know capsules dissolves faster in stomach than tablets, thus absorbed by the body faster. 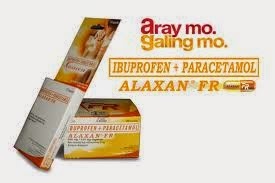 I don’t see any difference in the formulation of the two medicines, but according to a doctor friend, Alaxan FR has more Paracetamol in it which helps to relieve pain faster. So, there’s really no doubt that Alaxan FR works, and it works fast. I would take it with during a meal for shoulder or back pains, and within minutes the pain would subside though the parts would still be a little tender. The drawback is that you can't take this with an empty stomach. I guess that's all for now and of course don't take my word for it if you haven't tested it yet. Try it and see for yourself. Last April 1, 2014 Pure Jus hosted Zumbathon in Amber Ultra Lounge, Bonifacio Global City. An exciting, tiring zumba party that was one of the so many first times that I've witness for myself. Fortunately, I get the chance to meet Celebrities Nikki Valdes and LJ Reyes who went ahead and took the challenge of the 2 hour non stop Zumba. I was not in the zumba session obviously, but I'm pretty much happy just taking pictures and watch the ladies burn the calories and do the moves. And I must say, the two celebs where really good! And here are some of the shots I took, getting tired just by watching them, wew!...that was hours of zumba! One of the things in life that I think everybody should be an advocate of is the rally to be healthy. As they saying goes: Money can buy you medicine but not Good Health, so we better take good care of our body it is one of the things we can control anyway. THE HUMAN BODY REQUIRES NUTRIENTS. We cannot emphasize that more. Juicing is the easiest way to consume those vital vitamins, antioxidants, enzymes, and minerals needed to supercharge your immune system, boost your energy as well as help your body heal itself. And juicing is the first step towards a life-long commitment to a healthier lifestyle as well as the first square in your weight-loss regimen. Now its time for a little product review on the detox juices that I took. Mean Green - i think the reason why this one is called as such is because it fights obesity and beneficial for patients, the taste is okay for me because it tasted like you're drinking veggies which is something I like because I'm a carnivore kind of person. Ingredients of this are kale, spinach, malunggay, romaine lettuce, cucumber, green apple, lemon and celery. My overall experience on the product is pretty good, just like what other people said. 'Its healthy, combination of juices in a bottle and even took away the bloated feeling. You can also check their website Pure-Jus for more info. He crooned his way through the live shows of The Voicee of the Philippines with his celebrated vocal chords. Now, Paolo Onesa, the utimate heartrob crooner, is a certified recording artist as he releases his debut album "Pop Goes Standards"
“Pop Goes Standards”, the debut album by Paolo Onesa, is now out in CDs under MCA Music and through digital downloads via spinnr.ph and iTunes. For bookings and inquiries, contact Sammy Samaniego of MCA Music Artist Management at +632 9162504 local 107, +639178565174 and +639209682991. For more new and updates on Paolo Onesa, log on to the following sites: www.facebook.com/mcamusic, www.twitter.com/onesapaolo or www.twitter.com/mca_music. Are you a Mommy's Boy/Girl? The world will be celebrating the most important person on everyone’s lives on May 11! - Our Moms and all the Moms in our lives! Mothers’ Day made it formally to the US calendar as an annual celebration in the early 1900s, however, the celebration of mothers and mothering has always been part of the traditions of many people all over the world thousands of years before that. It is said that the greatest validation that moms will ever receive will always come from their loved ones, especially from their kids and their husbands. Whether it involves the grandest gestures of love or the simplest ones, as long as it’s from the people who matter most to them, it will always be special. This year, NIDO FORTIFIED makes the celebration more meaningful and ‘personalized’ with the launching of the ‘first-in-the-world’ WEAR YOUR LOVE CAMPAIGN which allows kids to take part in a simple yet most meaningful movement to recognize the #1MOM in their lives. NIDO FORTIFIED created a special website for this campaign which they launched last Tuesday (April 8) at the Chef Jessy . The idea of the campaign is to let kids to publicly show their appreciation for their #1MOM by declaring their heart-warming messages through customized shirts. The first 2,000 statements submitted to the NIDO FORTIFIED campaign website will be transformed into one-of-a-kind shirts produced by local clothing brand Bench Lifestyle and delivered straight to moms as surprise packages on Mother’s Day. Log on first to the www.nido-fortified.ph and follow the three easy steps below. Step 1: Confirm age. To start creating a shirt, click “Create a Shirt” or simply scroll down. The user must confirm his or her age first before proceeding. If he or she is younger or older than the age groups specified, he or she would need the help of an adult to join. Step 2: Create a shirt. To continue, users may select a pre-filled message or customize the statement along with the kid’s (entrant) name or nickname. Step 3: Register. To proceed, users must provide basic details for the free delivery of the shirt and determine the size of the shirt of their mom. A confirmation prompt will appear once all fields and items are filled-out. Upon completion of the basic steps, users will be led to the shirt gallery where the different statements shirts submitted by kids will be displayed. These are just some of the dishes that you'll love when you visit the restaurant. 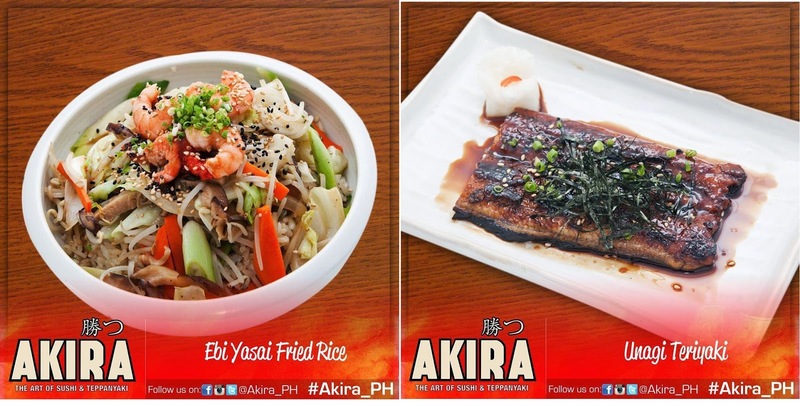 Akira Alphaland Makati Place is a franchise store. 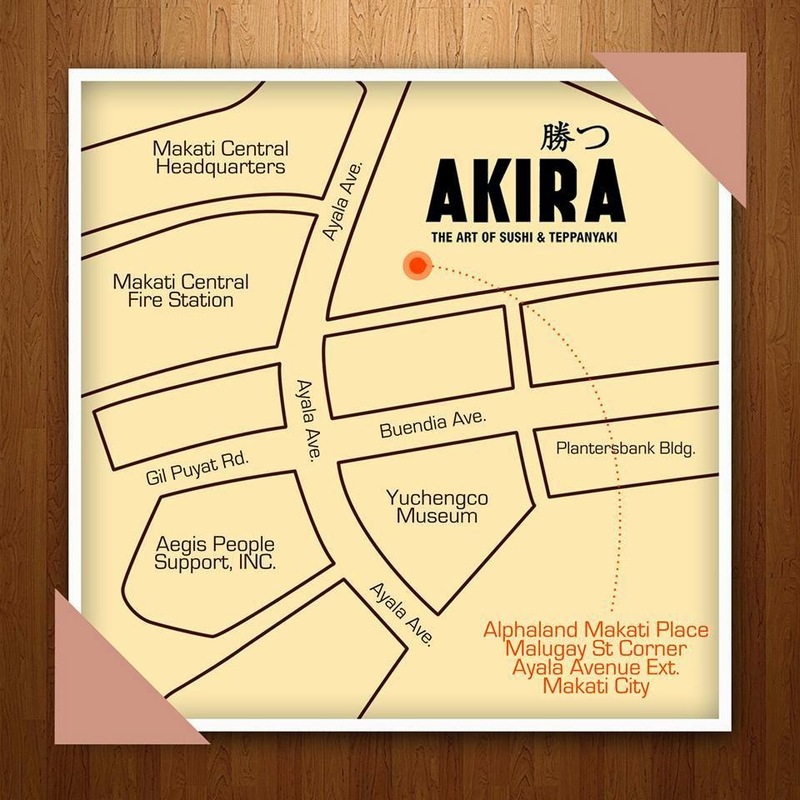 The 3rd Akira store located in Malugay St.corner Ayala Avenue Extension, Makati City. They accept reservations for corporate lunches and events. They can customize menu from their budget. Setting capacity is from 70 to 120 pax. Are you someone that not only likes reading books but also loves to write? Or probably someone that already have something in mind like a story or something you wrote for a subject. Then at this time and age technology can pretty much help someone like you(and me) to share your works via e-book, well it also has been my dream to publish a book of my own, be a well known author like what you see in popular bookstore stands. And honestly up until now, I still don't know what topic will best suite me, my personality my interests etc. I thought of something before that I think was a pretty good topic..its all about "Alak" and the benefits of 'Drinking'. Well, its kind of funny but its okay because that is one of the things that I would like to write about and share stories of me being drunk, things I do, like sleeping on where I sit and my friends taking pictures of me to capture that moment(also doing it to them if they got knocked out earlier than me) and the likes. Unfortunately someone already published a book after that topic so I have to think of another one...and it will be my hundredth time to do so if I remember it correctly, Good luck to me. Anyway, I was able to check Vibe Bookstore and got some of their reading materials when I attended the iblog event in Malcom Hall UP Diliman yesterday. And this was the one that got stuck in my mind. That I can get a chance of publishing my own e-book via Vibe Bookstore service. Before I go further, lets take a look at Vibe Bookstore first. 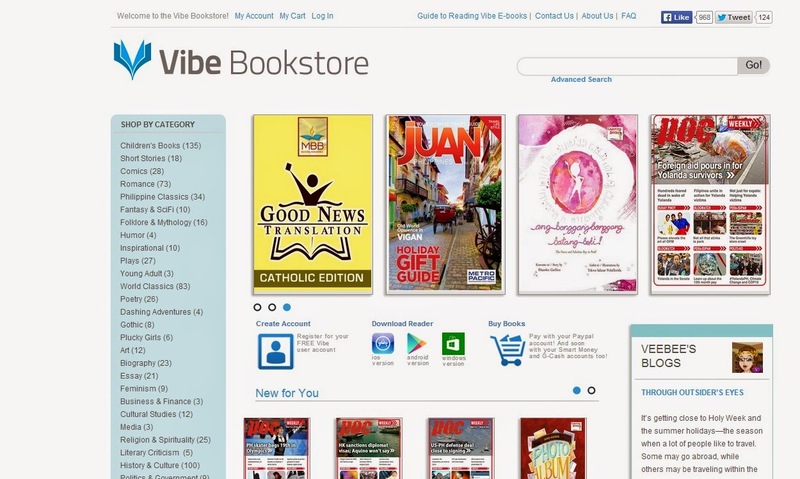 Lunch in 2011, Vibe is the first Philippine e-bookstore designed with the needs of the Philippine readers and publishers in mind. Their goal is to remove the barriers between authors and their readers, giving publishers access to a safe and secure platform that taps into the growing local and international e-book market. Vibe uses the electronic publication or ePub format which is supported by a wide variety of e-book readers. In ePub format, the text is reflowable, which means that the layout of the text automatically adapts to the size and orientation of the window or screen. This makes it much easier to read on various mobile devices. If you want to sell you books as an independent publisher you can sell those books to Vibe Bookstore which will convert your manuscript or pdf files into ePubs. You can also have the option of converting your e-books into interactive format adding engaging elements like audio, video, hyperlinks, or self-scoring exercises for a richer reading experience. Files that you will send are secured because it will be stored on a central file server that acts as a vault and is only accessible to the individuals who need to work on the files. Vibe e-books are stored on a production server linked to a cloud server and can only be encrypted by using a unique digital certificate assigned to each Vibe store buyer. The server tracks these requests, allowing them to pinpoint anomalous activity and flag suspected pirates. The e-book file cannot be opened by a device without the assigned ID, and attempting to extract the contents of the file will produce only gibberish characters. Now lets put ourselves in a readers perspective, when you log in to their website, you'll see a good variety of books. Most of the them that I noticed were children's book(Now that's probably one of the good things I haven't published a book about drinkers, not a good combination with children's book) and text books. In the website you can sign up for a free account and you can also download their app whether be android, ios or windows platform. At this time payment can be made though paypal and soon will use Smart Money and GCash. I guess these are just the things I can share for now about Vibe Bookstore. This Spa seems to live up with what Maginhawa street in Teacher's Village is which is well known for variety of restaurants and businesses that sprung up from the garage of home owners. Let me start with the time I went there which was a hot noon. Which is some sort of preference at that time due to the fact that the spa is fully booked every after 5pm of every day which gave me an idea that I'm in the right place because people loved the spa so will I in a few minutes. After my group completed the attendance that is required of us, we then went ahead and tour the spa. Honestly I'm not too much of a spaholic kind of person, but I must say that the first thing that I've noticed was the design of each room which is Thai inspired with huge 3 bed capacity in each room, not sure how many though but It I think should be enough to cater a spa party of 15 with 2 to 3 person in each room. The place and the smell was really nice, made me relax just by being around the rooms. Each bed has its own lockers where you can place your stuff. Although some of the residence mistakenly identifies the spa as a flowershop like what one of the staff mentioned, for me it still looks like a spa most specially upon entering the their glass door. There is a waiting area where it has a nice view of the outside. And I will continue my story as soon as I got an update that on the list of services that they offer aside from the massage, facials, manicure, pedicure body scrub that me and my mates experienced. Great Japanese Buffet, this is what this restaurant is. 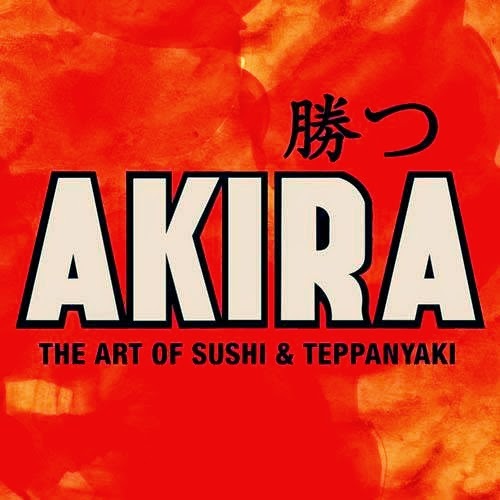 Truly an authentic Japanese Food Experience which serves every popular Japanese Food that I can think of. Everything is served fresh(not reheated food), great ambiance in the bay area which can cater around 300 persons in this more than 1,000 sq. 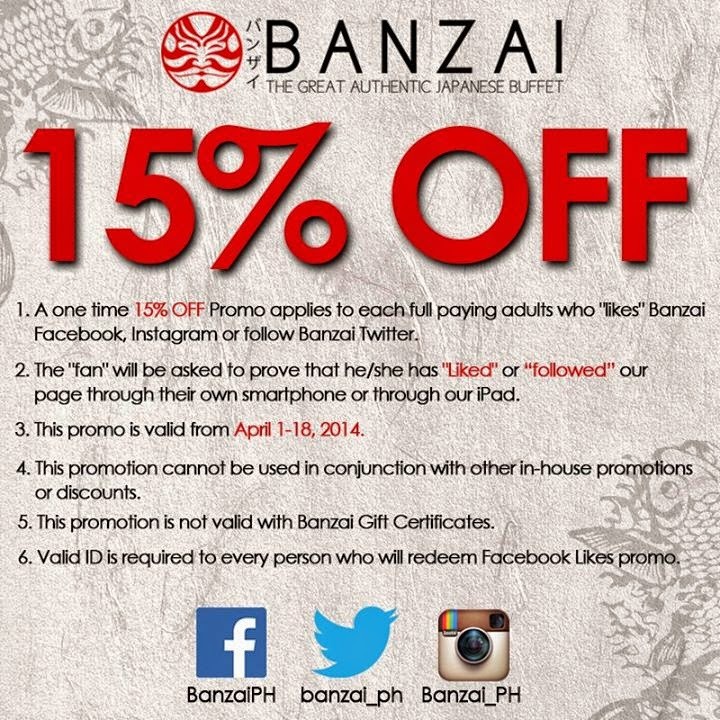 meters restaurant, and the best of what I've noticed is the Customer Experience Banzai is all-authentic Japanese. 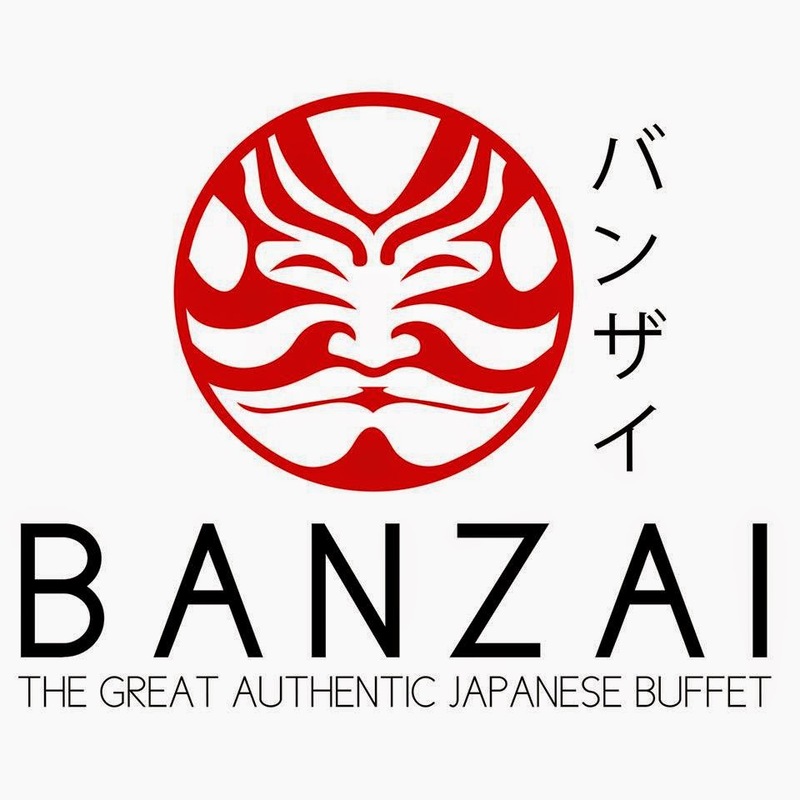 Banzai have two in-house Japanese chefs, all the ingredients are from Japan and have high consideration on quality, food is prepared the Japanese way - cooked upon request, no warming dishes. What I took personally as appetizer. Next to my plate is the Banzai gadget that alarmed after a few minutes telling me that Robatayaki is ready. Just some of the desserts you can choose from. Ingredients were displayed and highlighted in the restaurant which gives you a better idea of what the ingredients are of whatever is in the menu, or there is a another option for you. You can ask the chef or the person in each station of what type of food you are eating and the contents of the food. 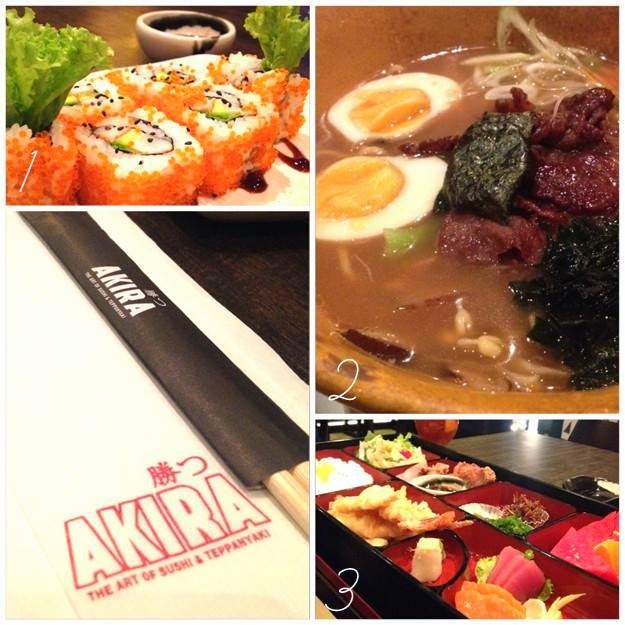 All-you-cn -eat buffet with a wide selection of Japanese cuisine. They also have regular promotions offered for group diners. You can also check their facebook, twitter and instagram as well.